The KNote5 is probably the most affordable tablet powered by the Celeron N4100 CPU on the market right now. 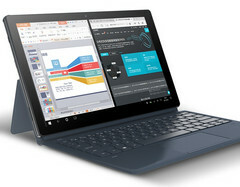 It also comes with 4 GB of RAM and 128 GB of storage, plus the integrated UHD Graphics 600 GPU.What really makes this a great deal is the all-in-one keyboard offered together with the tablet, while the 4,000 mAh battery provides enough juice for 10 hours of use. AlldoCube is a new Chinese maker specializing in tablets mostly. The company just announced its first Celeron N4100 model running Windows 10. The new KNote 5 comes with entry-level specs and a very enticing price, especially when bought together with the accompanying keyboard. The 2.4 GHz Gemini Lake Celeron N4100 quad-core CPU brings up to 30% increased performance over last year’s Apollo Lake version, and comes with 4 GB RAM and 128 GB storage. The touchscreen features an 11.6-inch IPS display with 1080p resolution and 16:9 ratio. Since this is a ultra-mobile device, the graphics are handled by the integrated UHD Graphics 600 chip from Intel. Gearbest has a special offer for this model. Users can order the KNote 5 tablet together with the all-in-one keyboard for only US$366.97.